With projects like Gobuntu and gNewSense aiming to provide a platform that is zealous about free software, the obvious question is “where can I run it?”. And right now, as far as laptops go, there are no good answers. Pretty much any laptop you can buy today needs some sort of non-free bits to make the most of its hardware, putting you in the tricky position of having to choose between hardware usefulness and software freedom. And boy, do we know about that choice in Ubuntu! There have been several threads about this, in comments on this blog and also on comments to Bug #1. Most of them have focused on free drivers but we should also be thinking about OpenBIOS (the new name for the LinuxBIOS project). An ideal solution would also use firmware that has a free software licence as well, but I personally would see OpenBIOS and free drivers as a good start. Right now, software freedom isn’t a huge priority for most of the companies that make up components for the PC and laptop industry. If we want to get onto their radar screen, we need to show that its worth their while to think about it. To that end I’d like to build up a list of people who are interested in this idea, and would potentially buy a high-powered laptop if it were guaranteed to work completely with free software drivers and OpenBIOS. Please go ahead and join that list if you think you would seriously consider buying a laptop that was powerful and designed specifically to be free-software friendly. This is a totally moderated list – I’ll only allow messages through that specifically let people know about the possibility of acquiring a laptop that can pass the free software test. So it’s news-only, and ultra-low traffic. If we can get sufficient numbers of people to express interest in such a laptop then I will start hunting for an OEM to offer a solution for pre-order. It will take a lot of committed buyers to move from concept to execution but if we can pull it off it will have an excellent ripple effect in the PC hardware industry. Make yourself heard! 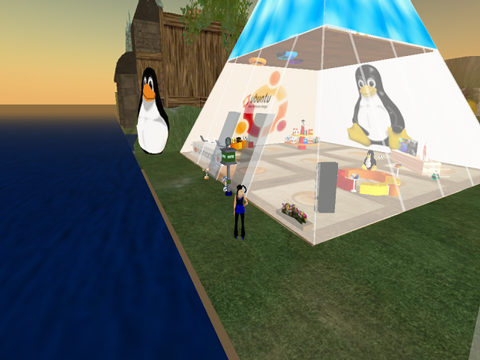 Catharina Bethlehem wrote to tell me about her work on the Ubuntu community in Second Life. As you might expect, the free and open source meme is very much alive and well in SL. There is now a group looking to setup an island devoted to FLOSS that brings together members of the whole free software community – multiple distributions and upstreams – for virtual socialisation and collaboration. Sounds like cool stuff indeed! Speaking of which, is anybody actively working on Ubuntu packages for the Second Life client? It would be great to see “sudo apt-get install second-life” DTRT.